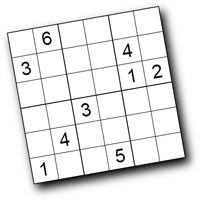 Here are hundreds of kid-friendly sudoku puzzles suitable for printing. Each of my puzzles has only one unique solution. 8x8 Puzzles - hey! it's almost a Sudoku! All puzzles ©2005 Jim Bumgardner / KrazyDad. Feel free to reproduce the puzzles for personal, church, or school use. If you would like to publish these, or similar puzzles in a newspaper or book, or would like a larger or different selection of puzzles, contact me at dad@krazydad.com.